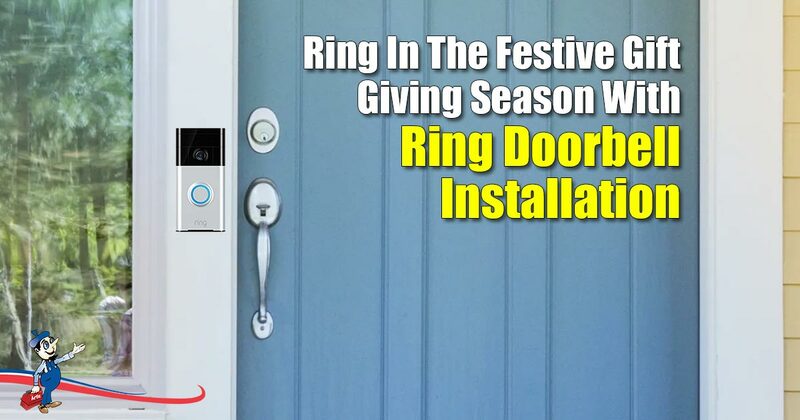 Ring Doorbell Installation – The Gift Of The Season! The festive season is a favorite time of the year for many people – it’s a time of gifts and joy and quality time spent with the family. What better way to show your family and loved ones how much you care by gifting them one of the state-of-the-art Ring Security Doorbells. At Art Plumbing, AC & Electric we believe in the joy of giving, and what more could you want than a video surveillance doorbell system! The ring security doorbells are a range of security and surveillance doorbells that function using the integrated ring application system. What this means is that once the doorbell is installed in the home you can easily link it to your mobile phone, PC’s or tablets by downloading the ring application from the app store. This gives you access to your doorbell video feed from within your pocket, making it hassle-free and easy to use. Customize your motion detectors to never miss when someone is at the door! When you are in full swing with family functions, you can sometimes miss the sound of the doorbell. Instead of leaving your family member waiting outside for a long time, the motion sensors can send an alert to your connected device to let you know that someone has stopped buy. Don’t know if the person you want to gift this system already has a doorbell? No problem! At Art Plumbing, AC & Electric we are able to add the ring security doorbell to an existing doorbell system, using the existing hardwiring to power the device. This is done by one of our qualified electrical specialists. If they don’t have a doorbell, that’s also not a problem! Ring security doorbells come with a rechargeable battery that can easily be removed and inserted. All ring products come with a guaranteed life-time warranty. This truly is a gift that keeps on giving for a very long time. So, while you’re busy cooking dinner for the family, you don’t have to leave what you’re doing to see who’s at the door! You can access the video feed from the doorbell on your linked device. This allows you to be able to safely answer the doorbell or only answer the doorbell if it is necessary, leaving you free to continue preparing for the festivities! Additionally, this system allows you to see who is at the door before answering it. This allows you to watch for unwanted solicitations, UPS deliveries or people who are just visiting. If you feel like spreading the holiday cheer by giving someone this wonderful gift, Art Plumbing, AC & Electric have the ring doorbell security systems in stock for the festive season. There is something for everyone! We also do the entire installation as well. The ring electrical installation process includes linking the device to the preferred locations’ power source, connecting the device to the home Wi-Fi and testing to make sure it works, leaving the recipient of this gift with no stress that can come with DIY installation. If you are interested in purchasing this innovative technology for your loved one, or even for yourself, let one of our electrical experts at Art Plumbing, AC & Electric aid you – give us a call today at 1-800-475-1504!